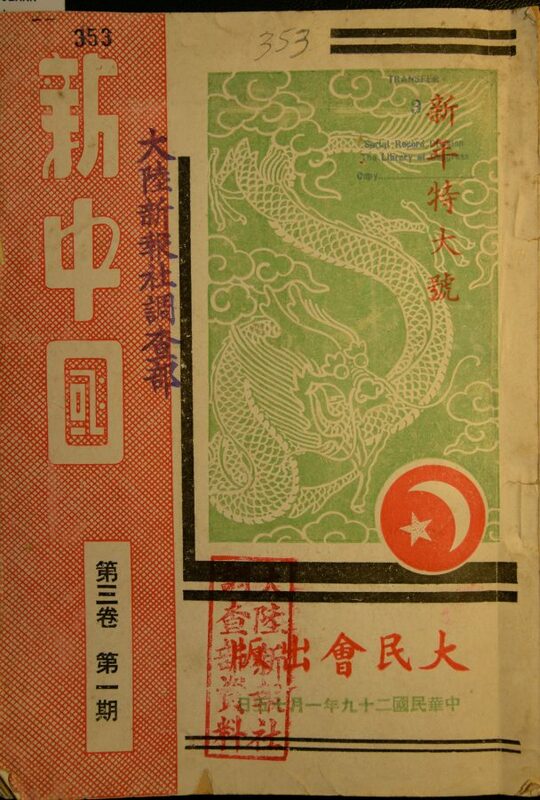 Cover image of propaganda magazine, showing a woodcut image of dragon in clouds, and the logo of the Daminhui. This is the cover image of the magazine Xin Zhongguo (New China) 3.1 (January 1940), published by the Daminhui (Great People’s Association) in Nanjing. The Daminhui was a propaganda and mobilization organization established by the Japanese in 1938, which was later folded into Wang Jingwei’s Kuomintang (Nationalist Party). The Daminhui specialised in public expressions of support for the occupation, and employed a staff of Chinese organisers, artists, and writers. The sun-and-moon logo of the Daminhui can be seen on this magazine’s cover. The untitled woodcut image of the dragon is unattributed. It is included here to coincide with the New Year (which this issue of Xin Zhongguo celebrates). 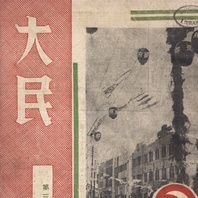 Significantly, text on the magazine’s cover suggests that this copy of New China was once owned by investigations department of the Japanese-language, China-based newspaper, the Tairiku Shinpō. Liu Jie, “Kangzhan chuqi Huadong luanxianqu qin-Ri qunti yanjiu: yi Daminhui Zhenjiang lianhe zhibu wei zhongxin de tantao” (A study of pro-Japanese groups in occupied areas of east China in the early stages of the War of Resistance: A discussion of the Daminhui’s branch office in Zhenjiang), Zhongyang yanjiuyuan jindaishi yanjiusuo jikan 98 (2017): 89-114.